Engagement in learning is defined as the degree of attention, curiosity, interest, optimism and passion that students demonstrate. Most of the current research shows that an increase in student engagement leads to improved retention and heightened skill acquisition. What are you going to do about it and how can this impact you as a golfer? Have you ever had a boring practice session? Headed to the range to get your ‘reps’ in? It’s time for us to move beyond rote practice regimens because when practicing, the ideal environment is one of engagement and ultimately, challenge. 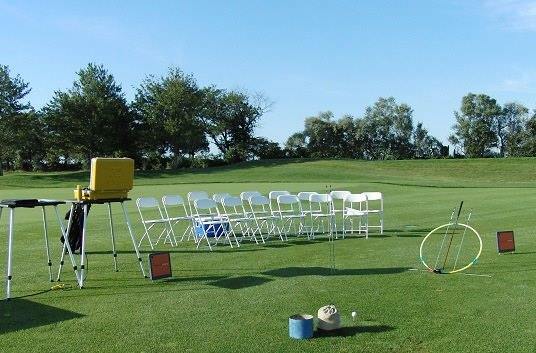 Don’t get me wrong – block practice will always have a place on my lesson tee. It just shouldn’t be the only form of practice we put in. Let’s incorporate challenges where you keep track of a score or an outcome. Let’s try to do things you previously have been unable to do. If you’re doing all you can to beat your personal best score for a particular chipping challenge, you cannot help but be passionate, interested and optimistic. That’s where the real growth occurs! To a certain degree I’ve looked up the research to see if it aligned with what I’ve been seeing anecdotally with my students recently. I’ve created a few games to challenge some of my better golfers during their long hours on the range and the results have been promising. They find themselves spending less time on the technical aspects of their golf swing and more time trying to break ‘records’ and put up a ‘score’ and I like that. They do too! These challenges are really fun to work through and they will certainly engage you in the process of executing better golf shots. I’ve even found that asking students to report there score to me via text or Edufii serves to heighten their level of engagement and thus learning. My hope is that this article serves to cause you to institute productive changes into your practice routine. Make 2018 the year where your performance finally meets your potential.